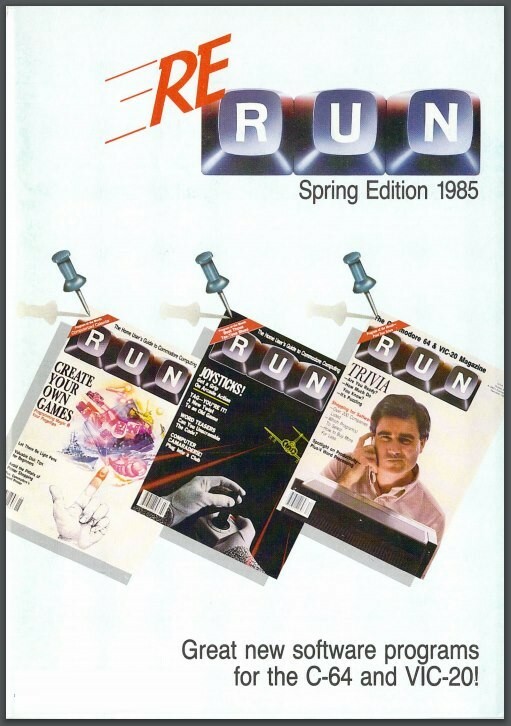 ReRun was a smaller version of RUN Magazine that included a small number of reprinted articles with a focus on programming of Commodore VIC-20, C64 and C128. Below are all of the known editions. They have been OCR’d so you can search through them. September/October 1991 RERUN – THIS SEPTEMBER/OCTOBER EDITION of ReRUN marks another significant milestone in our long and illustrious history. After this edition, the documentation that you normally read here will become an integral part of the disk itself. That means that a separate booklet will no longer be necessary. Don’t worry-these lively editorials will still be there, only on disk rather than on paper. Of course, if you prefer to read from a printout, we’re also providing the option to print all the documentation found on the new disk. Thanks to a new ReRUN interface, every new edition will be equipped with documentation on disk, an interactive design, and an elimination of the current C-64 and C128 menu systems. While we’ve always prided ourselves on Basic listings that users could examine and learn from, we’ll still provide the RUN listings in the same form that they appear in the magazine so that they can be listed and examined. With this new interface, we look forward to publishing ReRUN for years to come….